Logitech has been pushing hard to win back the gaming crowd in recent years—and I’ll be damned if the G933 isn’t one of their best shows yet. How good? Well, I’d probably save a $100 (or more) and take this headset over our long-standing high-end recommendation of the Astro A50 and the SteelSeries Siberia 800, barring a few exceptions. Indeed the G933 can currently be found on Amazon for well below its MSRP. As an update to Logitech’s G930, the G933 sports a familiar look. It’s got the same bulky air traffic control heft, the same coffin-shaped earcups instead of traditional round ones. 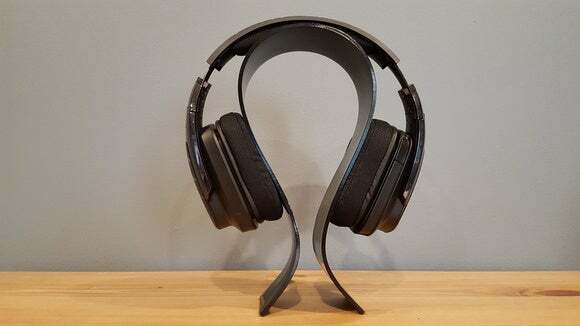 It’s easily identifiable as the heir to Logitech’s old gaming headset. Nevertheless, the G933’s been prettied up. Logitech has added RGB lighting, of course. Like the rest of the company’s modern lineup, the G933 sports full 16.8 million color profiles for the strips of lighting on the rear of each ear and the lit-up logos on the facing sides. Sure, it’s pointless. But it looks good, and Logitech continues to offer some of the best lighting in the industry. 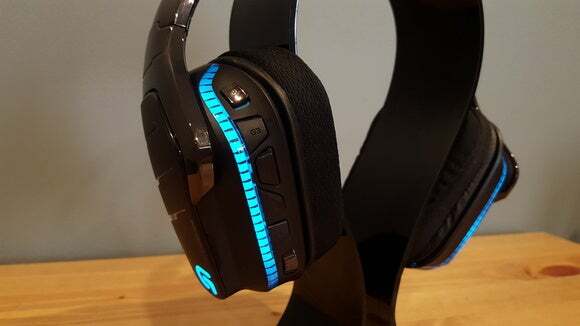 But illumination aside, the G933 is simply a sleeker headset. The G930’s ears were particularly ugly, a flat slab of matte-finish plastic saddled with the old, very-corporate Logitech logo and some chunky controls. The G933 ditches that enterprise look, and instead features a less obtrusive logo (and logo placement), as well as some decorative accents that give it a lighter aesthetic. 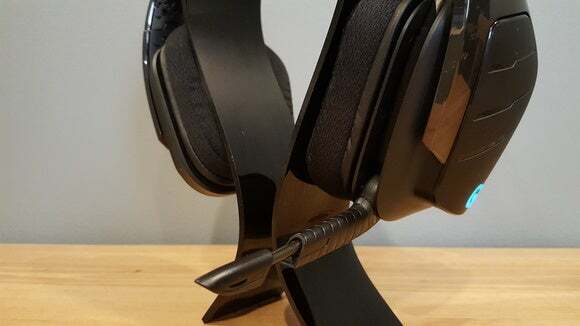 Some of it’s strange and a bit overdone—like a scattering of decorative triangle shapes inside the headband—but for the most part, these changes help the G933 look more like a modern headset and less like a relic of the ’90s. The G933 also moves its buttons to the rear of the headset, which helps with its clean, uncluttered look. All controls sit along the back of the left ear, and each has a unique shape for easier memorization if that’s your thing. You can control the power via a switch, toggle the EQ setting, turn surround sound on or off, cycle the lighting effect, mute the microphone, and adjust the volume. You can also reprogram the three “G” keys in the middle (labeled G1, G2, and G3) with a ton of other preset commands—or entire macros, if you prefer. Also on the left ear is the microphone, though you might miss it at first glance. It retracts and folds directly into the earcup, making it practically invisible—but then folds down like a normal boom microphone and extends out so you can bend it towards your mouth. The design is a gorgeous bit of engineering, albeit pretty useless. With headsets that I can use as decent street headphones, like the Polk Striker Pro, having a detachable or foldable microphone is useful. The G933 is so bulky, though, that I doubt I’d wear it away from my computer. The microphone style speaks to Logitech’s ingenuity more than practical application. A more useful design aspect is convenient storage of the USB dongle, given that I’ve misplaced wireless dongles in the past. You just pop off the plastic plate on the left ear cup. The right plate also pops off, in case you want to replace the G933’s battery in the future. Rounding out the design, the bottom of the left ear has a micro USB charging port and a 3.5mm analog jack. You can use the latter to plug the G933 into a phone, gamepad, or whatever—no battery required, though you’ll lose out on the lighting. But again, I wouldn’t wear these on the street. They’re big and goofy, despite Logitech’s improvements. My one and only problem with the G933, and a reason for some of you to stay away: It’s tight. The fit gets better the longer I wear it, but this headset still tends to vice-grip my head and leave me sore after a few hours of use. Corsair’s Void Wireless slips around more, but feels more comfortable—as does the Astro A50, if you’re willing to stomach the jump in price. The G933 certainly sounds good, though. Running the default “Flat” stereo setting, it’s a moderately bright, punchy headset. I could do with a bit more low-end—and I did adjust that immediately by utilizing the “Drop the Bass” (eye-roll) EQ setting, and then tweaking from there. But the G933 is a solid setup. The oversize ear cups give audio plenty of room to breathe in both gaming and non-gaming environments. Music sounds surprisingly good, too, though I’d still give the edge to the Astro A50 or HyperX Cloud (or any number of actualheadphones). Like most headset manufacturers these days, Logitech touts G933’s 7.1 capabilities. I’ll give them this: The G933 has better simulated surround sound than most. Unlike some notable competitors (I’m looking at you, Corsair), enabling surround doesn’t ruin the G933’s sound. There’s little noticeable distortion, and in some games (Battlefield, for instance), it even does a serviceable job emulating surround. But those moments are few and far between, and even a “pretty good” implementation of surround sound in a headset doesn’t really measure up to even the weakest of real-world, multi-speaker setups. I ended up leaving the setting off most of the time, because it either added very little or actively detracted from what I was listening to: for instance, muddling sounds together and creating a jumble of noises or hollowing out the center channel. The G933 in stereo is good enough as is. The G933’s microphone’s frequency response is decent, but this mic is more sensitive than most at picking up background noise. Every creak of my chair registered loud and clear, and my voice had a noticeable amount of hiss behind it—possibly from the microphone picking up the sound of my computer’s fans. 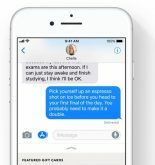 So it’ll work, but maybe consider using push-to-talk so you don’t annoy your teammates. As for range, I was able to get the usual 10 meters away from the dongle before audio dropped, even in my high-interference apartment. I did however notice that after the sound cut out and I moved back towards my PC, it took longer to find a signal than other headsets. Battery life is a bit disappointing—if only because I just experienced that of the Corsair Void Wireless and Razer Man O’ War. My usage averaged around eight hours before needing a recharge. While this is better than most wireless headsets, it pales in comparison to the 12-plus hours you’ll get with the Man O’ War and Void Wireless. Two final side notes: Logitech has fixed some early issues with the G933, so feel safe to ignore these points if you hear about them. First, you can now change how long the G933 idles before turning off. And second, the headset no longer thinks “50 percent battery” constitutes “Low,” and thus won’t commence beeping at you every two minutes for four hours. Those constituted my biggest complaints, and have been resolved by a firmware update. 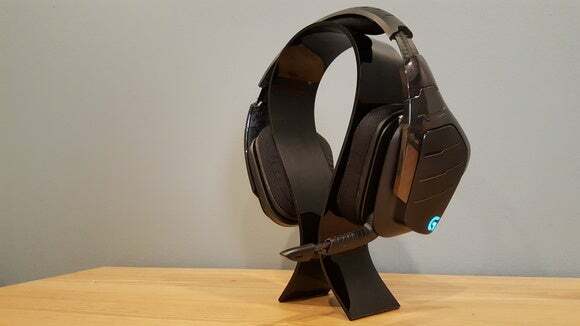 The Logitech G933 would be a pretty good headset at its list price of $200. 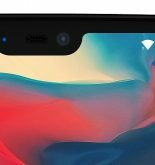 At its pretty-much-permanent sale price of $150 to $180, it’s probably the best price-to-performance ratio you’ll find, as wireless headsets go. Sure, the Astro A50, SteelSeries Siberia 800, and the rest of the very high-end wireless headsets nail a few particulars better than Logitech—but they’re also twice as expensive. The G933 is good enough that most users won’t even notice a difference, and priced reasonably for a wireless headset. You can burn the money you’ll save on a Steam Sale.